It’s the BIG TFTTF SLACK CHALLENGE REVIEW .. with a little twist, it’s also on video. Chris also looks into how film converts the color spectrum of light into black and white and how you can benefit from that knowledge when you convert your digital photos and get much better results this way. The post 809 Up Your BW Game appeared first on PHOTOGRAPHY TIPS FROM THE TOP FLOOR. Toning originated as a darkroom process designed to extend the longevity of black and white prints. Photographers did so using chemical toners such as sepia, selenium and gold. Toners work by removing silver from the print and replacing it with another element with a longer life span. A side effect of toning is that it adds colour. Sepia toned prints range from light yellow to deep brown, selenium is a subtle blue or purple, and gold anything from blue to deep red (if applied to a photo that has already been sepia toned). For many photographers the colours were just as important as the archival benefits because of the emotional values they added to the monochrome print. Another, more unfortunate side effect of darkroom toning is that many of the chemicals are hazardous. Luckily, in the digital age, there is no need to use them. Toning is much quicker, and you can create any colour tone you like, using Lightroom’s Split Toning panel. Furthermore you can use Virtual Copies to create several different versions of the same image, each with a different tone. It makes experimenting easy, and you can compare them afterwards to see which you prefer. You can even turn your favourite toning effects into Develop Presets so you can use them again whenever you want. Before we start, let’s look why you would tone a black and white photo. With digital, there is no need to tone for archival purposes, that leaves two reasons. The first is simply because you want to add some colour. Toning is a good way to do that and can really lift your images. The second reason is to add emotional value to the photo. For example, sepia toning both flatters the model and adds a sense of nostalgia and warmth. Blue toning, on the other hand, adds a cold feel. These four photos are processed identically apart from the toning treatment. The colour makes a huge difference to the appearance and emotional impact of each image. It should be noted at this point that not all black and white photos take well to toning. 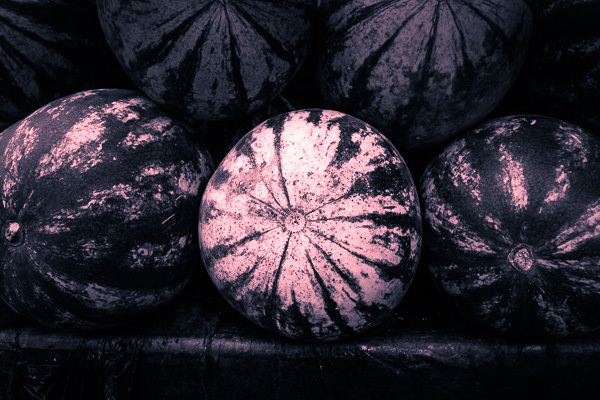 The best images to use are those with lots of dark tones (plus some highlights for contrast – my article about tonal contrast goes into this more). Black and white photos with lots of light tones don’t seem to tone as well as those with lots of shadows. The Split Toning panel is simple to use. The first pair of Hue and Saturation sliders sets the colour that is applied to the photo’s highlights. The second pair sets the colour that is applied to the shadows. The Balance slider is used to give precedence to either the highlight or the shadow colour. If you hold the Alt key down while moving the Hue slider, Lightroom displays the Hue at 100% saturation, helping you judge the colour accurately. Here are some examples. 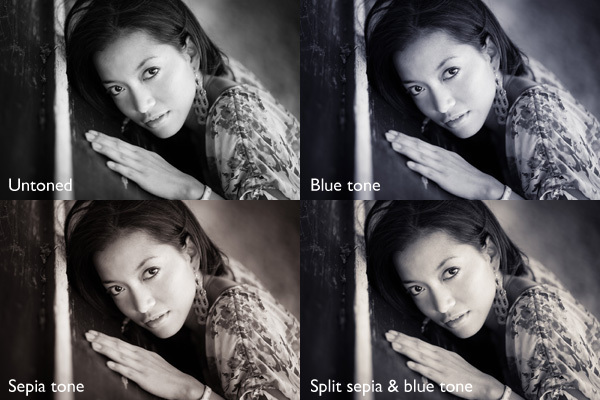 Most black and white split toning combinations are a variation of the following. Untoned black and white image. Sepia tone applied to shadows only, leaving highlights unchanged. Sepia tone applied to shadows and highlights. Blue tone applied to shadows only, leaving highlights unchanged. Blue tone applied to shadows, sepia tone applied to highlights. This is the classic split tone look. Split toning like this helps create a sense of depth. Basic colour theory tells us that warm colours appear to be closer to the viewer and that cool colours recede. Applying a cool tone to the shadows and a warm one to the highlights helps reinforces a similar sense of depth created by the effective use of tonal contrast. Blue tone applied to shadows, copper tone applied to highlights. This imitates the blue and copper split tone effect that was possible to achieve in the chemical darkroom. Sepia tone applied to shadows, gold tone applied to highlights. This imitates the sepia and gold split tone effect it was also possible to achieve in the chemical darkroom. Those combinations should be enough to get you going, and of course you can experiment as much as you like with the sliders in the Split Toning panel to see what you can achieve. 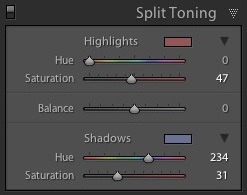 Please share some of your split toning creations in the comments below. 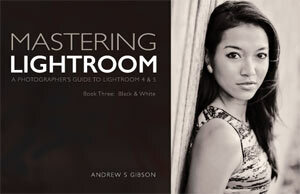 The post How to Split Tone Black and White Photos in Lightroom by Andrew S. Gibson appeared first on Digital Photography School. The post tfttf628 – Black and Whitebalance appeared first on Photography Tips from the Top Floor. Last week I start shooting with my Dads old Exa 1b - the ultimate analog weapon made in GDR 30 years ago. Its a great feeling shooting 100 percent manual ... Folks, such a old camera makes the time standing still for a while, I took 12 pictures in 2 hours :). I'm still waiting for the negatives - thats why I show you another capture taken in 2009 - a pearl which finally finds its place here. After moving from Mynicki to Fatamanta some of my favorites pictures got lost, they still "sleep" and wait for a reincarnation. This post is the first one and I hope you like this way of showing some fine moments as set. Last week I got some Emails asking for Mynicki ... thanks a lot for your mentions, they pushed me. This step was/is so important for myself - I'm stranded here for something new and it feels good. » This is a collection of 13 pictures, click on the image to see all. English: This is one of these shots which waits for long to find a place here. I love browsing the archive in long dark nights like this one and discovering some pearls and finaly process them. Good night - have a really nice weekend! Tomorrow I'm looking forward to build a snowman :). German: Das ist wieder eine dieser Aufnahmen die lang darauf gewartet hat, hier ihren Platz zu finden. Ich mag es einfach in langen kalten Nächten im Archiv zu stöbern, kleine Perlen zu entdecken und diese zu entwickeln. Gute Nacht - ich wünsche Euch ein wundertolles Wochenende! Morgen, so hoffe ich, baue ich einen Schneemann :)!